RRB Bilaspur recruitment 2019| Latest JE 433 vacancy notification link! 2.2 RRB Bilaspur Railway jobs 2019-2020| Apply online at www.rrbbilaspur.gov.in? RRB Bilaspur recruitment 2019-2020: Applicants from Indian nationals (male and female) are invited from the desirous and eligible applicants to fill-up 433 following vacancies to the posts (JE), DMS & CMA jobs in the railway recruitment board Bilaspur zone. All the interested candidates must check out the important dates, eligibility criteria such as Age limit, Requirement & desirable Education qualification, Exam Syllabus, Exam pattern, official notification and apply online link. You can apply for the railway jobs on their official website (http://www.indianrailways.gov.in or http://www.rrbbilaspur.gov.in/ ) as per given below schedule. Age Limit: The age of applicants should be between 18- 28 years. 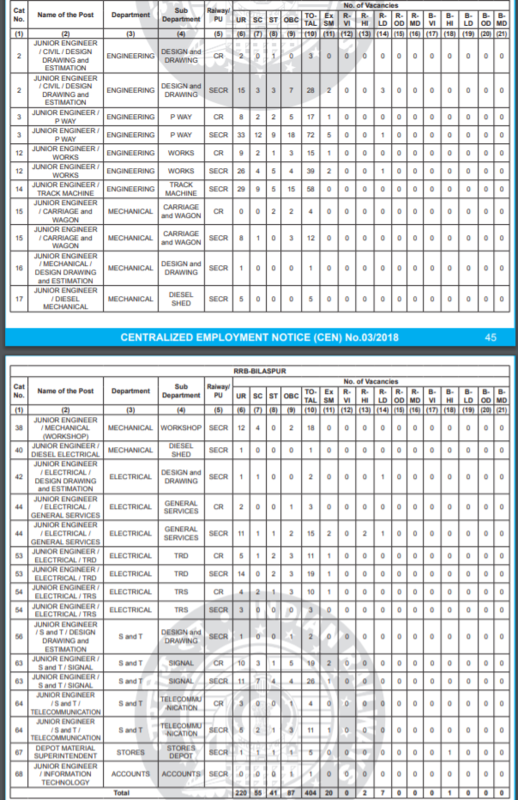 RRB Bilaspur Railway jobs 2019-2020| Apply online at www.rrbbilaspur.gov.in? Keep ready a scanned/digital copy of one recent passport size color photograph (3.5 cm X 3.5 cm, JPG/JPEG format, 100 DPI, 20 KB to 50 KB size) of yours and scribe (if applicable). Filling up information like personal Email ID and mobile number of the candidates are compulsory. the date time and center of the written examination and other information will be informed you here.